Cuts to government defense spending would strengthen Britain’s enemies, including the Islamic State jihadists and Russian President Vladimir Putin, two former NATO chiefs have warned. Anders Fogh Rasmussen, who left his post as NATO General Secretary in 2014, and his predecessor, Jaap de Hoop Scheffer, said that a failure to meet NATO members’ 2 percent of GDP military spending target would send a message of retreat to global aggressors. Their warning came a week after it was revealed that US President Barack Obama gave Prime Minister David Cameron a frank warning that cuts to the UK defense budget after the British general election would weaken members of NATO and send a poor message to European allies. Chancellor George Osborne and David Cameron have repeatedly refused to commit to the 2 percent spending target should the Conservatives be reelected. Military chiefs are concerned the UK Armed Forces will bear the brunt of further cuts after the Tories announced they would protect NHS, education and international aid funding. Rasmussen, who chaired the NATO conference in Wales where Cameron urged countries to meet the 2 percent spending target, told the Telegraph that a failure to commit would send a message of “retrenchment” to Russia and terror organizations. He added that a lack of sufficient military spending would encourage aggression. His remarks come as the ceasefire agreements in Ukraine appeared to be in danger of collapsing over the weekend. 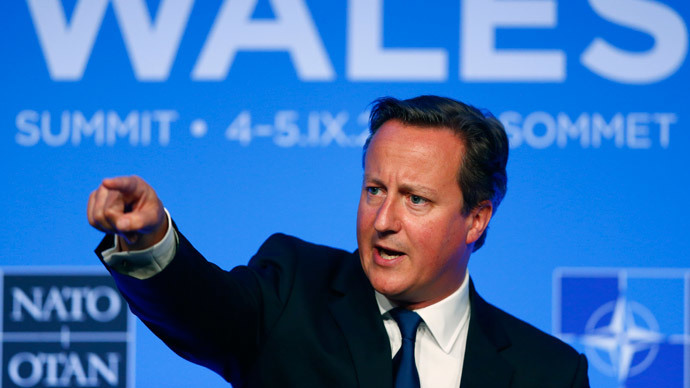 The NATO summit in Wales last September saw European allies promise to recommit to the 2 percent defense spending target, with Cameron claiming the UK would “aim to continue” hitting the mark. De Hoop Scheffer, who served as NATO general secretary before Rasmussen told the Telegraph that cutting defense spending would show that Britain’s international influence is shrinking, and warned against reneging the public commitment to 2 percent spending. “This is Great Britain, one of the most important and influential allies in NATO. That ally reneging on 2 percent would be very serious, very serious indeed,” he said. “British diplomacy is rather absent in the framework. Did you see Angela Merkel and François Hollande trying [to secure peace], going to Moscow, going to Minsk? But I ask myself the question: ‘Where is the British Prime Minister? Why is he not fully involved in this?’” he added. The former chiefs said they had no wish to interfere in UK politics, but expressed hope that Britain would continue to maintain defense spending. Military chiefs have previously said without 2 two percent target being met, the armed forces will be unable to meet their 2020 goals.